They say we are the sum of our experiences. And, although my preference for reading over math has never been a secret (sorry, math nerds) I entirely believe this to be true. When reading, I find it so much easier to meaningfully connect with characters with whom I share some digits in the otherwise distinctive equations of our lives. 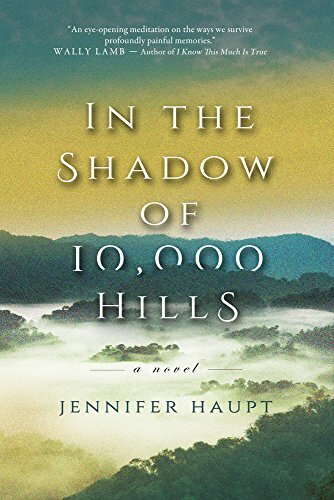 Oddly, though I may outwardly appear dissimilar to the characters that populate In the Shadow of 10,000 Hills, the events that shaped me are quite parallel to those that impact the protagonist of this moving Jennifer Haupt novel. While this book is about many things, the spine of the tale is the protagonist – Rachel’s – search for her father, Henry, a man who abandoned her and her mother when Rachel was quite young. Since her father’s difficult-to-understand-especially-for-a-child disappearance, Rachel has wondered about him on numerous occasions. But as she undergoes the rigors of bedrest, preparing for the birth of her first child, the frequency of these thoughts increases exponentially. To child Rachel, his departure was confusing. To adult Rachel, it’s incomprehensible. Sitting in her bed, six months pregnant, she already feels such a bond to the little life kicking around inside of her. How could her father, who she thought cared about her, walk away from everything – including her? If Rachel had proceeded through her pregnancy and gotten her happily ever after, the thoughts about her father would have probably remained just that – fleeting notions in her brain that didn’t produce any real action. But, when she experiences a late pregnancy miscarriage she, quite understandably, falls into deep despair. With the loss of her pregnancy, her once-certain future is rocked and she is left with more questions than answers. While only time will provide the certainty about her future that she needs to truly heal, she can seek a resolution to the unanswered questions that fill her past by searching for her long-absent father. Though Rachel is the central protagonist of this tale, the sweeping saga is told through many perspectives, including that of Lillian, the woman her father was chasing after when he went to Rwanda in the first place (because, let’s face it ladies, men are always chasing after some woman or another). But Lillian is not just another home wrecking bimbo (and, in truth, the home established by Rachel’s parents wasn’t really much to wreak anyways). She is, instead, an important figure from his past. Henry, a photojournalist, first met Lillian when he was but a cub, tasked with photographing the then up-and-coming Reverend Martin Luther King, Jr.
As Rachel comes to discover, her father and Lillian have a history that pre-dates her and a connection that, at least it would seem, can’t be severed. Like most sagas this story is about the characters and the gossamer threads of relationship that bind them, but it’s also about a place. You see, Henry and Lillian were trying to map out their futures, and make their marks on the lives of those less fortunate, in the early 1990s. This time period, as it would turn out, is pretty much the worst possible time to be in Rwanda. Settling in this place at this time forces them to face with the horrors of the Rwandan genocide, a 100-day period in which an estimated 1 million Rwandans were brutally slain. And just as the horrific events of this period have undoubtedly left their mark on those who still call Rwanda home, they leave an indelible impact on our characters and their actions. Vastly different from many of the other books that fill my shelves, this novel was powerful, profound and provocative. It asked hard questions, provided difficult answers and forced readers to move away from black and white and deal instead in shades of gray. Haupt was able to produce the true emotion that this novel elicited by building rich and realistic characters that spoke to her readers. As I cradle my toddler, born after a very difficult pregnancy – complete with my own stint of modified bedrest – and reflect on my life as a daughter who has never met her father, I felt a deep connection to Rachel and a meaningful desire to see her reach an if-not-perfect-at-least-happy resolution. And he’s right. It is. We are the sum of our experiences and the product of our journeys – both physical emotional. A difficult but important read, this book will stay with me for quite some time. I give it an enthusiastic 5 out of 5 cocktails. Time to read something new… something lighter… something easier… something that doesn’t force me to reckon with my own skeletons. Want to see what I pick? Follow me, here. I am woefully ignorant about modern history. Prior to reading this novel, I knew little about the horrors of the Rwandan genocide. While I fully recognize the importance to being informed, I must admit that the main thing drawing me to the daily news is… well… David Muir. That being said, I know that things happen daily that shape my life. What event from modern history do you wish you knew more about? Tell me about it in the comments, below.